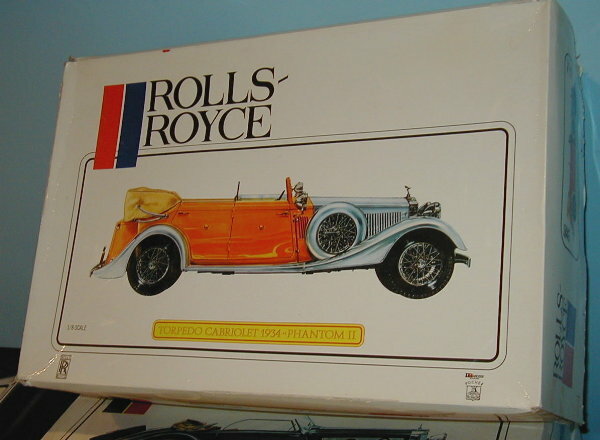 Pocher K75 Rolls Royce Torpedo Cabriolet 1/8 scale model kit! This is the first edition kit of this wonderful model. We like this first edition kit because the shiny silver plastic is actually quite shiny and can be used without painting. In the later editions, Pocher changed to a grey plastic that needs to be painted to get the chrome look of the original. As with all Pocher models, this one includes working parts for the engine; working doors and windows; working hood and bonnet; working headlights; and a top that can be installed either up or down. However, remember that this is a Pocher kit and nothing fits right on the first try. Most parts need to be adjusted in some way in order to fit properly. Please note that we have this Rolls Royce kit in stock most of the time as we buy and sell constantly. Please ask for details of the specific kit we have in stock as very often the top of the windshield frame is broken. This is not a huge problem but it is important for you to know the specific condition of the kit you are buying.